The Energy Department's National Renewable Energy Laboratory (NREL) has released the 2017 Annual Technology Baseline (ATB), updating a key source of reliable electricity generation technology cost and performance data used to support and inform electric sector analysis in the United States. Now in its third year, the ATB documents technology-specific information on a broad spectrum of electricity generation technologies, including wind, solar, geothermal, hydropower, biomass, coal, natural gas, and nuclear. ATB LCOE range by technology for 2030 based on current market conditions. 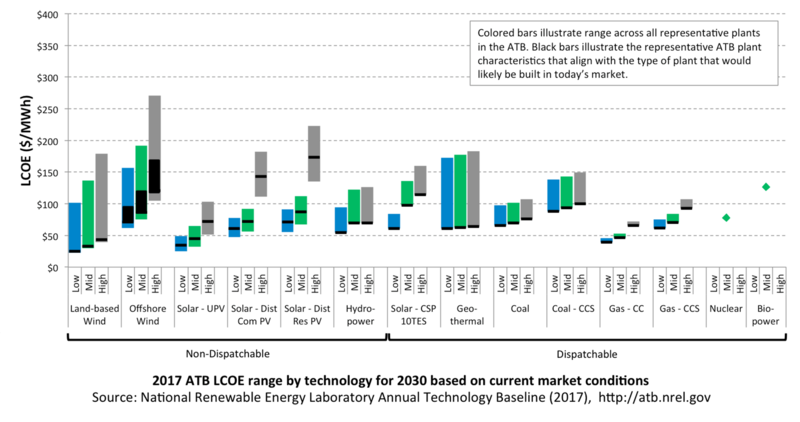 Levelized cost of energy LCOE values calculated using macro-economic indicators (e.g., interest rates) estimated for 2017 in the U.S. Energy Information Administration’s Annual Energy Outlook 2017. The ATB focuses on electricity generation technology capital cost, operating costs, and energy production. It does not include time-varying macro-economic indicators. Values shown in 2015 U.S. dollars; hydropower is classified as non-dispatchable because most new hydropower generation would operate in run-of-river mode. LCOE captures the energy component of electric system planning and operation, but the electric system also requires capacity and flexibility services, typically associated with dispatchability, to operate reliably. The ATB synthesizes current and projected data from various sources into a highly accessible and widely referenced resource for energy analysts. The 2017 ATB is available in a new interactive website at atb.nrel.gov and will be featured in a webinar on August 29.